This entry was posted in Global Warming in Perspective, Uncategorized. Bookmark the permalink. 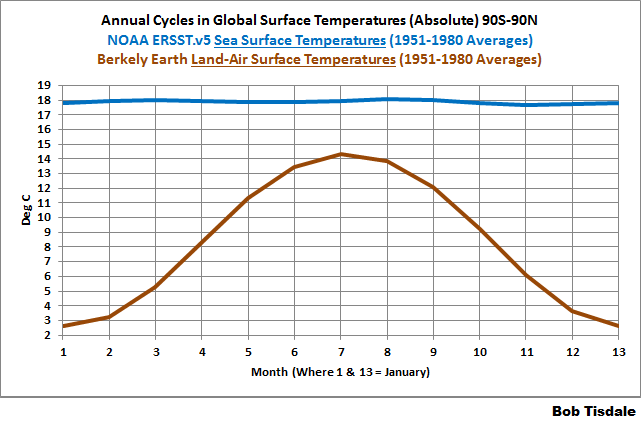 23 Responses to Do Doomsters Know How Much Global Surface Temperatures Cycle Annually? Can you get the doomsters to read what you have written on Earth temperature changes? This would go a long way into getting the doomsters onto reality. Terry, i if anyone could get them to read and understand, it’s not likely it would make any difference. Do you think their beliefs can be altered with reality? Temperature data taken at weather stations contain a diurnal cycle, a seasonal cycle, and random natural variations. Along with these they may also contain a long term trend over a period of many years. Typically, the diurnal and seasonal cycles represent more than 80-90% of the total variance in the actual temperature measurements. The remaining 10-20% or so consists mostly of unexplained random variations. 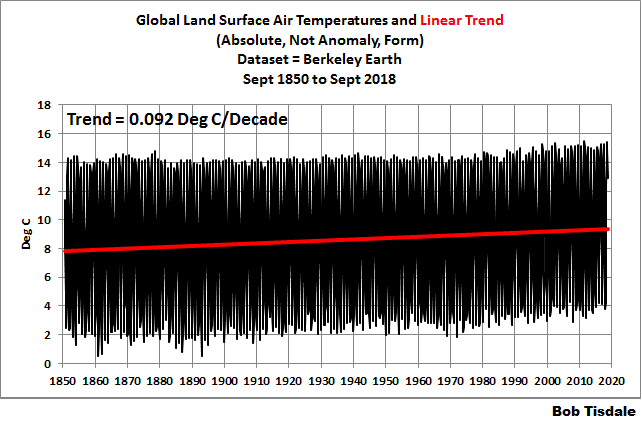 In cases where a statistically significant trend is found with OLS linear regression, no more than a small portion of the variance, around 3% or so, can be ascribed to a long term warming or cooling trend. Long term trend must be understood and studied in this context. Here is a modest proposal. Bob. Suggesting the doomsters have no reality begs the question: a court of law needs to take the doomsters to task; for fraud and false information to public. I have requested the Heartland Institute go directly to President Trump to order the US Justice Department to prosecute these frauds and false info to the public. I urge you to do the same. Point out these frauds and false info to both the white house and the justice department; so they can prosecute these fraudsters. Getting facts or reality strait matters big time. False info to the public is a crime and needs to be prosecuted to put a stop to false info to the public; for the sake and safety of scientific inquiry to help keep politics out of scientific inquiry; as we have seen too often in the last 50 years. Bob why is the HADCrut4 data trend less than Berkeley since 1850? Here’s the HAD 4 from YORK Uni tool showing 0.055 c/decade from 1850. Berkeley is 0.062 c /dec using this tool. Any comments? Berkeley infills areas without data, like the Arctic, with make-believe data where the HADCRUT dataset does not. Thanks Bob, but can you also tell us what you think of the joint Royal Society/ NAS Q&A. Their point 20 looks at the outcome if all human co2 emissions stopped today. So just a fantasy, just ask China, India and the non OECD countries. We know the ice core studies show co2 levels remain elevated for thousands of years after temps dropped at the end of the much warmer Eemian inter- glacial, so I suppose this could be correct if you accept the ice core data. But would the temp remain at present level and not drop for a thousand years or more? And would co2 levels not drop to say 1800 levels for many more thousands of years? If they are correct then it doesn’t make much sense to rave on about all their wild so called MITIGATION . And the non OECD countries co2 emissions continue to soar, so the Q&A above is just absurd. Here’s their point 20 and a link to the larger graph. So Bob what do you think of their point 20 Q&A and the 2013 Zickfeld et al study? 20.” If emissions of greenhouse gases were stopped, would the climate return to the conditions of 200 years ago? If emissions of CO2 stopped altogether, it would take many thousands of years for atmospheric CO2 to return to ‘pre-industrial’ levels due to its very slow transfer to the deep ocean and ultimate burial in ocean sediments. 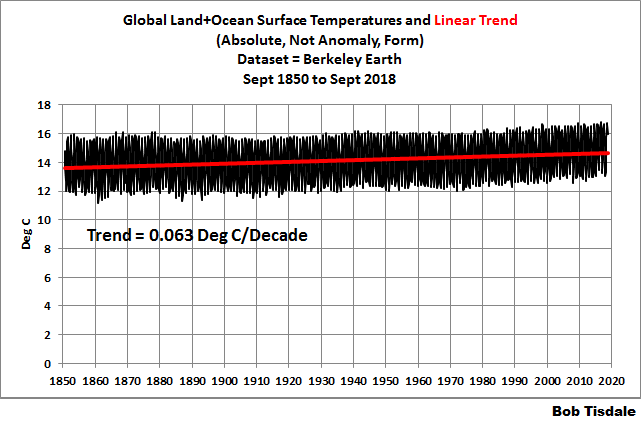 Surface temperatures would stay elevated for at least a thousand years, implying extremely long-term commitment to a warmer planet due to past and current emissions, and sea level would likely continue to rise for many centuries even after temperature stopped increasing (see Figure 9). Significant cooling would be required to reverse melting of glaciers and the Greenland ice sheet, which formed during past cold climates. The current CO2-induced warming of Earth is therefore essentially irreversible on human timescales. The amount and rate of further warming will depend almost entirely on how much more CO2 humankind emits”. ngard2016, sorry to say but I have no interest in the joint Royal Society/ NAS Q&A. Additionally, it’s off topic. No geologic information from the 20 tectonic plate volcanic rift edges appears to be included; over 60,000 miles of volcanic rifts. At over 4000 Deg. C in the Earth interior just below Earth’s crust around 20 to 30 miles down; all the heat escaping to the oceans and Earths atmosphere needs to be accounted. Without it, there is no crediblity in any comments on Earth’s temperature changes. Will you be including the heat from Earth’s interior to the oceans and Earth’s atmosphere in any future temperature computations? Looking at half the problem or less is not helpful, ngard2016; though useful as a partial but incomplete and non-useable review. Or your comment.is only a starting point. Terry, you’ve obviously missed the subject of this post, and you’re asking questions about a topic for which there is no long- or short-term data. If there’s no data, all there is is conjecture, and I don’t plot conjecture. 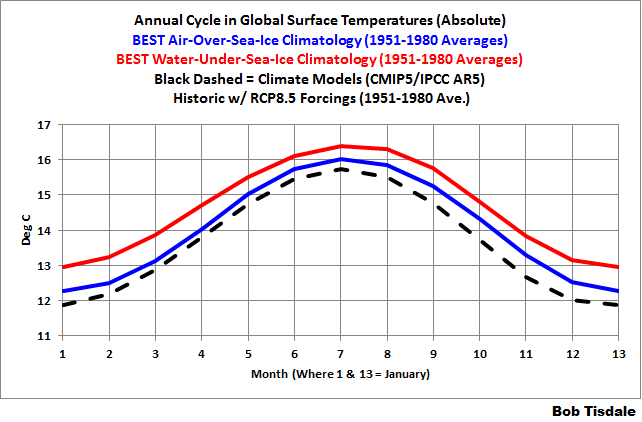 Pingback: A Quick Post before the Monthly Global Surface and TLT Temperature Update | Watts Up With That?